Gen. John Kelly is virtually certain to be president-elect Donald Trump’s pick to run the Department of Homeland Security. The final call and acceptance, sources told CBS News, has not occurred but is expected soon. If Trump chooses Kelly, he will be third general tapped by the president-elect, joining Gen. James Mattis, Trump’s pick to become the next secretary of Defense, and Lt. Gen. Michael Flynn, Trump’s incoming national security advisor. Like Mattis, Kelly is a Marine with a reputation for bluntness. Kelly was the commander of U.S. Southern Command until earlier this year. In that posting, he oversaw American military operations in South America and Central America. 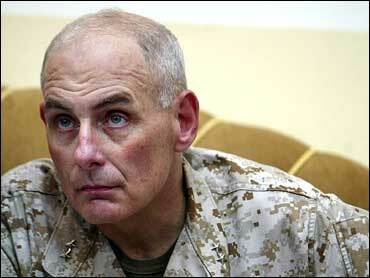 Before that, he commanded American forces numerous times in Iraq, and spent a year as the top Marine in that country. He then was an aide to defense secretaries Leon Panetta and Robert Gates. Created after the 9/11 attacks, the Department of Homeland Security now employs nearly 250,000 people. Trump pledged repeatedly to better secure America’s borders on the campaign trail, and it is likely that Kelly, should he take the position, will be central to that effort. Unlike Flynn, Kelly did not endorse Trump during the campaign and indicated he would be open to serving in either a Republican or Democratic administration. He has also referred to domestic politics as a “cesspool” in an interview over the summer with Foreign Policy magazine. Kelly, who served nearly 46 years in the Marine Corps, is the highest-ranking American military official to lose a child in combat since 9/11. His son, Marine Lt. Robert Michael Kelly, was killed in action in Afghanistan in 2010.